Britain really loved Sonic. Especially in the early days, this country had tons of gear. It was also fairly well mass-produced so enough fans could get their hands on it. It is also highly tradable and is still being bought and sold today. Want some? Look at the link to the left for Ebay. Push that right away to get started. If you don't see anything the first time, come back each week and look again. Patience is the key to grabbing the vintage stuff you want. But, mind that pounds are higher than dollars. There is a lot of contraversy about the UK and its influence on Sonic goods and continuity. 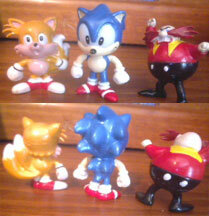 Like "They Created Robotnik" and "Fat Sonic came from there". 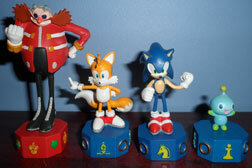 This page is not here to solve these great mysteries, but it will show you a bunch of neat (and odd) Sonic items. 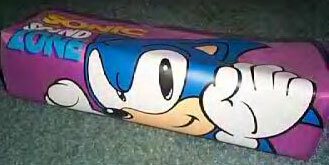 Sonic House Hold Goods- Redecorate! Lamp Shades, utensils, bedding, curtains etc. Sonic Foods- What sort of great Sonic stuff did they have to eat? Even More Everything Else: Page 2! Curious Disk Launchers. This looks like someone is trying to re-invent the Pog. As you can read, there are "2 rare disks inside". Also note that the package says "Metres" instead of 'feet'. What kind of 'cool games' can you play by launching disks? You probably have to buy it to find out. 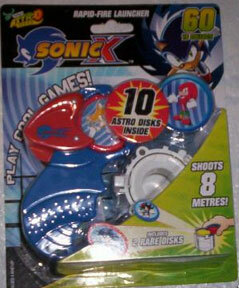 There are also Give-Away disk launchers as a part of a fast food Sonic promotion. SonicGear still needs pictures of the actual disks that came inside this one, though. A Card Game of "The Cool Blue Dude". The image on the front is Japanese. Does anyone have images of the cards themselves? The cards were quite high quality, similar to Pokemon cards, & are about 8 inches in length & 5 inches wide. The default game is chancy & random, yet quite fast (typical basic childrens card game) & was for four players or less. However, due to the broadness of the card set, many different games can be played. It consisted of 7 "character" cards & many "ring" cards. 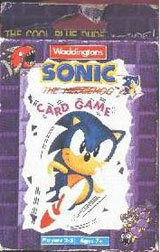 The character cards had a Sonic character printed on it (Sonic, Tails, Princess Sally, Dr. Robotnik, Crabmeat, Caterkiller and Buzzbomber - Sonic, Tails, Sally and Robotnik were all "AoStH" style and the Badnik cards were in-game style) & the Ring cards had a number of rings on a basic Marble Zone background. take it for themselves. If it is a Ring card, they put it in the "discard pile". If the player draws a Ring card with a one ring value, he/she attaches it to a Character card. Then it goes to two, then three, then four until eight. Once a character card has 8 ring cards on it, the player earns a point & the character & all rings cards are put on the discard pile. Once the deck is empty all cards in the discard pile are re-shuffled & the game is played over. Once the time limit runs out, the player with the most points wins. 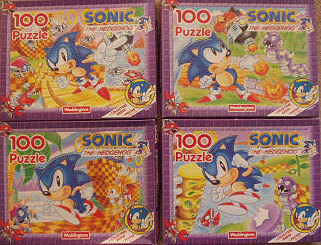 Jig-Saw Puzzles. 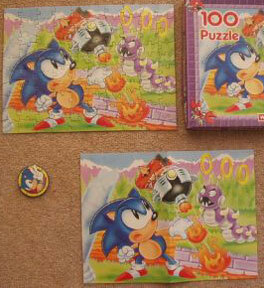 Notice that Sonic has the exact same expression on 3 out of the 4 puzzles. These came with a round...token or something. Someone has put together their puzzle. 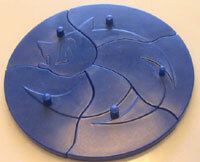 You can see the round widget, and that the puzzle does not end up very big when you are done. Also: Poster-like object. Someone started re-packaging and re-selling the AOSTH episodes and calling them "Special Features" There's another one of this as well, with more eps. This one had the Chaos Emeralds/Alt. Sonics arc. Quality was always blurry on this photo, but the tape is rare. 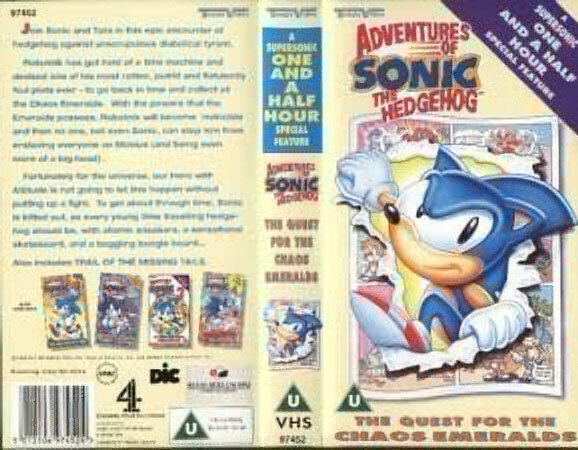 This is defenitely from the UK, and was released along with their "Channel 4" which was airing Sonic at the time. Placement credit on this one goes to DarkWing UK, thanks! Now THIS is a nice piece of loot. 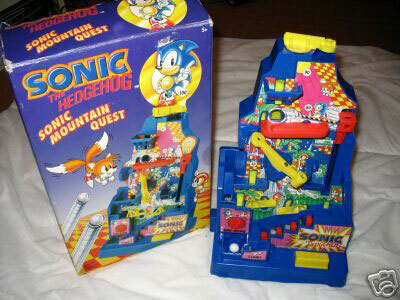 This is "Sonic the Hedgehog Mountain Quest". This big, 3D game is somewhat like an interactive maze. You fiddle with different controls, trying to get the ball up to the top of the game. (buttons, springs, levers, knobs, noises etc) It is 1 player, and may be timed. This game is actually a Sonic-ized version of a concept. There are other similar games with different names such as "Run yourself Ragged" and "Hazard Mountain" which are just generic. They have different obstacles, though, and a totally different look. This interesting, complex game is a wonderful addition to your collection. So unique! 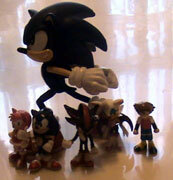 With these tiny toys, Britain gets an exclusive Sonic item. These are "Capsule Figures", so named because they are dispensed in a little round plastic thing like a gum ball after putting a coin into a machine. The USA doesn't have really sophisticated capsule machines much, but Japan does, and they're slowly creeping around the world dispensing things better than super-balls and gum! Each figure comes with a piece of the base, and a little paper that shows the other figures. 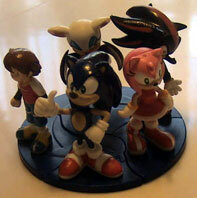 If you can collect them all, the base fits together and has the Sonic X Sonic face symbol on it. You can see an action figure from the MegaBots line in one of the photos, to tell just how small these are! Despite their small size, you can see that the figures have nicely painted details and are well sculpted. They are not like the often messy bendy small figures from the USA. If you can get ahold of them, they look like a nice, worth-while item to collect. Photos by AlexZ and Gary. Want to buy these figures in 2009? 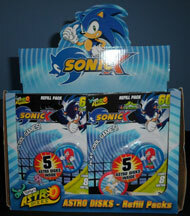 You can get them for only Pound 1.99 each at www.sonicxstore.com , which is better than trying for random ones in a machine. Ordinarily, this magazine would be on 'magazine pages', but it's directly tied to the figures above. This is "Chess Acadamy Magazine" issue #1. In order to try and drum up some interest of chess fans, they decided to produce "An Exclusive Chess Set of Sonic Characters", using all modern designs. They'd enclose a figure with each issue until you had a full set. 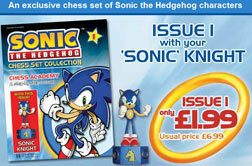 It's a great gimmick to keep people buying issues, they'd want to complete their chess set. However, was chess (a slow game) really a great choice for looking for "Crossover Fans" from the Sonic/Video game fandom...that's notorious for fast, impatient people?